A Website Form enables new subscribers to join your List from within your website. Like your website’s email signup form but for texting. There are 3 different embed options for website forms. Double-opt-in confirmation is required for all website form opt-ins. Forms can be used on all plan levels, including Forever Free. Each account can have an unlimited number of forms. 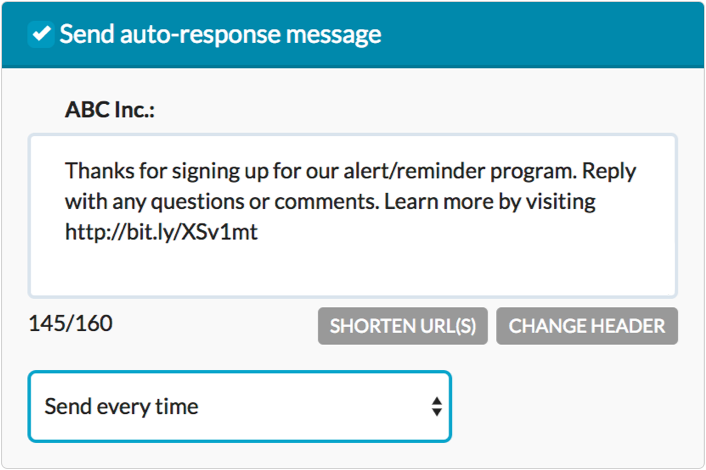 Subscribers are able to reply to any message they receive, including website form auto-responses. Text-message alerts signup - The most common use case for website forms is to enable website visitors to signup for your Clearstream List. Multiple website forms can be used for unique pages or content on your website as each form can be tied to it's own specific List. Integrate your Clearstream account with website's current contact form or CMS - the HTML embed option lets you customize your form to look like and work with your current website's contact form or CMS form. You can also use our API if you think you'll need more control and flexibility. Enable people to join your List via social media pages - The Hosted URL embed option enables you to use a URL that contains your website form. Simply copy and paste the Hosted URL link anywhere, such as your social media pages. To get started creating your new website form, click "Forms" on the left main menu. Click "Create Form". Note: Forms can be edited or deleted at any time. 2. Choose What Subscriber Info to Collect. By default, a Form will capture the mobile number of a new subscriber. You can also enable first/last name and email address capture. 3. Select Which List(s) Subscribers Will be Added to. Subscribers are stored in Lists. Create a new List or select the List(s) new subscribers will be stored in. Multiple Lists can be selected. 4. Create Auto-Response Message. A custom auto-response message will be sent to the new subscriber once they submit the Form. 5. Click "Create Form". Your Form is active as soon as you create it. You can always edit it's settings from within the Forms section of your account. Once your Form is created, you will need to copy and paste the embed code into your website's HTML editor. Your embed code can be found at the bottom of the View Form page. There are 3 ways to embed or use your form: HTML, Iframe, or Hosted URL. Below you will find live examples of each. This is the simplest way to embed your form into your website. Copy and paste the code on your page into your website's content editor. By default, the form will fill the width of the container it's in. You can also make any inline styling changes to the Form. 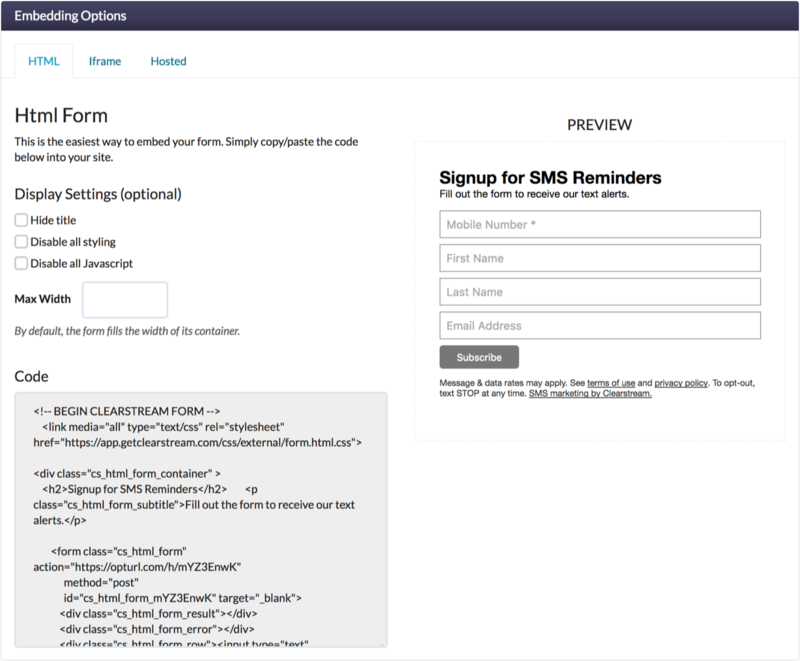 Embedding your Form as an Iframe lets you have the entire opt-in Form within it's own frame. You can edit the max container width and height from within your Form settings. A Hosted Form uses a URL that is hosted by Clearstream. Simply copy and paste the URL. This is useful if you want to point people to your Form from 3rd party websites such as social media.